The FreeMotion EPIC Beauty Bell Rack F220 stores up to 800 lbs. of dumbbells. Sixteen molded plastic dumbbell trays are set in 2 rows for maximum storage. Up to 8 pairs of 16 individual Beauty Bell dumbbells of 50 lbs. or less fit in this rack. The Beauty Bell Rack also features bolt-down holes for added safety and durability. This rack was also built with heavy-duty steel and is electrostatically powder-coated for a commercial, sleek finish. Call 1-800-875-9145 to speak with one of our fitness advisors with any questions you may have. Go to FitnessZone.com to order your FreeMotion EPIC Beauty Bell Rack F220. 120 Days Upholstery & Handles/Accessories. 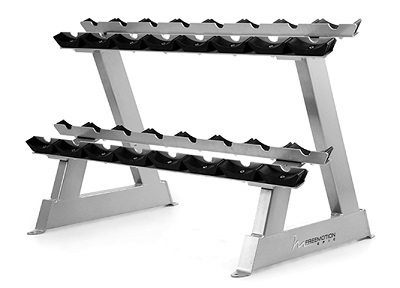 Order your FreeMotion EPIC Beauty Bell Rack F220 from FitnessZone.com today!